We’re very happy to announce the opening of an exhibit we have been working on for the past few months. 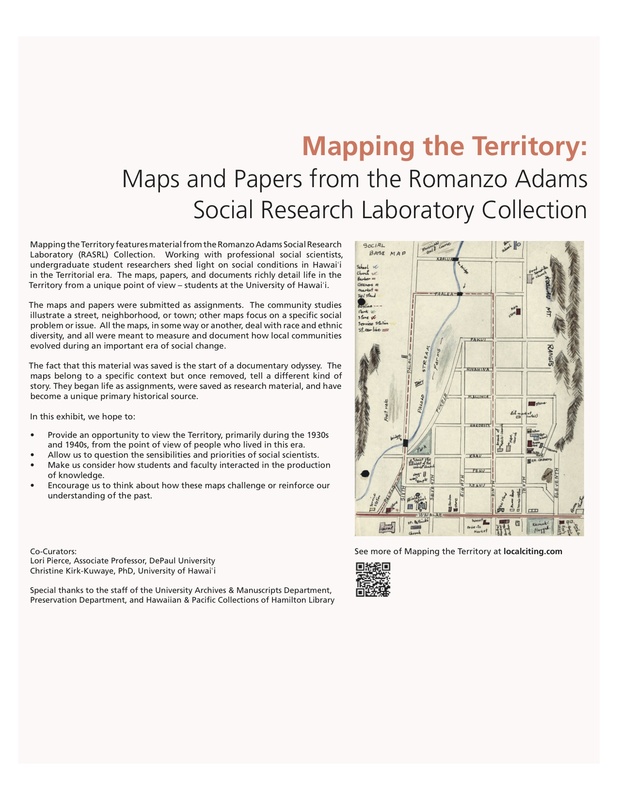 Mapping the Territory features maps and a few papers from the RASRL Collection, the same material featured on this site. On display are three large maps that document social issues that were of concern to the Mānoa sociologists: youth and crime, education and public health. We also selected a few student papers that had maps attached to them, Lihue, Kahuku, Ōla‘a, Kaimukī, Hale‘iwa, and Kahului. You can see an on-line version of the exhibit on our companion site, Local Citing. We’ve written demonstration essays like the ones featured here that discuss the maps and provide historical and social context. The exhibit is on display from January 17 to June 30 in the Moir Reading Room, Hamilton Library at the University of Hawai‘i at Mānoa. If you’re in Hawai‘i, please visit. If you’re not, please visit the on-line exhibit.